Many current and aspiring college students have the desire to earn an MBA for career advancement opportunities, and you may be wondering if you can receive an MBA from a Christian college or a faith-based institution. The fact is that an MBA can dramatically increase your earning potential, and it may help you to climb the corporate ladder and to achieve professional goals that you have, according to CBS News. Many colleges and universities offer MBA programs, but you may have the desire to attend a Christian college. Some colleges and universities offer only Bachelor’s degrees, but many offer higher level or advanced degrees. This includes some of the top Christian colleges and universities in the country. Many who have the desire to earn an MBA want to attend a recognizable and highly reputable school so that their degree may have more weight when applying for jobs or seeking career advancement. Some of the top Christian schools in the country offer MBA degrees, and these include Pepperdine University, Southern Methodist University, Belmont University and Texas Christian University, to name a few. You can spend time researching Christian colleges or universities that appeal to you to determine if those schools offer MBA programs to current or prospective students. Before you apply to a business school to pursue your MBA, you should take time to ensure that the schools that you plan to apply to will be a good fit for you. Each school’s MBA degree has a different level of earning power, and you should research the earning power of a degree for the schools that you are thinking about applying to. Weigh this against your current level of income and the cost of the education. In addition, if you have the need to take classes remotely or with evening or weekend hours so that you can continue to work in your field while earning your MBA, this should also be considered. Many colleges and universities offer flexible learning options for MBA students, but this is not always the case. You should also pause and consider if you actually need an MBA degree. If you have the desire to climb to a higher position within your field, such as with an executive or director-level position, you likely will need an MBA or an even more advanced degree. However, if you are satisfied with your position and may simply have the desire to earn more money in your line of work, there is not a guarantee that an MBA degree will help you to achieve your goal. You should also consider if the school that you are applying to will have the clout and esteem that is necessary to help you achieve your career goals. For example, an MBA degree from Pepperdine or SMU may have considerably greater clout than an MBA from a lesser known local school. 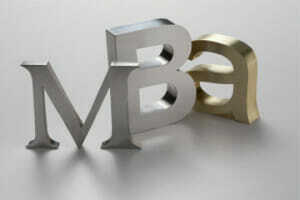 After conducting research, you may decide that you want to pursue a higher level of education and work toward your MBA. The good news is that you can receive an MBA from a Christian college, and there are numerous Christian colleges located across the country that offer MBA degree programs for students.